Standard Radio System Plan SRSP-516, Issue 1, Technical Requirements for Wireless Communication Service (WCS) Operating in the Bands 2305-2320 MHz and 2345-2360 MHz , replaces SRSP 302.3, Issue 1, dated January 2004. 1.1 This Standard Radio System Plan (SRSP) states the minimum technical requirements for the efficient use of the frequency bands 2305-2320 MHz and 2345-2360 MHz by the Wireless Communication Service (WCS). 1.2 This SRSP specifies technical characteristics relating to efficient spectrum usage only, and is not to be regarded as a comprehensive specification for equipment design and/or selection. 1.3 This SRSP also sets out requirements for international and domestic coordination and requirements to mitigate interference which must be followed by all licensees in these frequency bands. 2.1 This SRSP supersedes SRSP 302.3, Issue 1, entitled Technical Requirements for Wireless Communications Service Operating in the Bands 2305-2320 MHz and 2345-2360 MHz . 2.2 The arrangements for non-standard systems are outlined in the document Spectrum Utilization Policy SP Gen, General Information Related to Spectrum Utilization and Radio Systems Policies. 2.3 Even though a radio system conforms to the requirements of this SRSP, Industry Canada may require modifications to the station or system whenever harmful interferenceFootnote 1 is caused to other radio stations or systems. 2.4 Industry Canada should be advised when potential conflict between radio systems cannot be resolved by the parties concerned. After consultation with these parties, the Department will determine what modifications need to be made and establish a schedule for these modifications in order to resolve the conflict. 2.5 The Department may require licensees to use receiver selectivity characteristics that provide improved rejection of harmful interference. 2.6 WCS equipment must be certified in accordance with Radio Standards Specification RSS-195, Wireless Communication Service Equipment Operating in the Bands 2305-2320 MHz and 2345-2360 MHz . 2.7 Licensees are required to make available to Industry Canada, upon request, information on certain technical parameters of their radio systems. 2.8 Revisions to this SRSP will be made as required. The current issues of the following documents are applicable and available on Industry Canada’s Spectrum Management and Telecommunications website at http://www.ic.gc.ca/spectrum, under Official Publications . 4.1	The frequency bands 2305-2320 MHz and 2345-2360 MHz are available as one paired block of 15 + 15 MHz as shown in Figure 1 and Table 1. Various channel sizes may be used within the blocks based on technology choices of the licensee. 4.2 Mobile and portable stations are prohibited from transmitting in the band 2315-2320 MHz of block W and band 2345-2350 MHz of block W'. 4.3 Mobile and portable stations using frequency division duplex (FDD) technology are restricted to transmitting in the band 2305-2315 MHz. 5.1.1.1	The equivalent isotropically radiated power (e.i.r.p.) of the base and fixed stationsFootnote 3 (with the exception of fixed subscriber stations) operating in the band 2305-2315 MHz or in the band 2350-2360 MHz shall not exceed 400 watts within any 1 MHz band; and shall not exceed 2000 W within any 5 MHz of bandwidth. The peak to average power ratio (PAPR) of these transmissions shall comply with the limits specified in RSS-195. 5.1.1.2	The e.i.r.p. of the base and fixed stations (with the exception of fixed subscriber stations) operating in the band 2315-2320 MHz or in the band 2345-2350 MHz shall not exceed 2000 W within either 5 MHz band. 5.1.2.1	The e.i.r.p. of fixed subscriber stationsFootnote 4 shall not exceed 20 watts within any 5 MHz band. 5.1.3.1	The e.i.r.p. of mobile and portable stationsFootnote 5 shall comply with the corresponding e.i.r.p. limit specified in RSS-195. 5.2.1	The transmission duty cycleFootnote 6 of fixed subscriber, mobile and portable stations using time division duplexing (TDD) shall not exceed 38%. 5.3.1	Fixed subscriber, mobile and portable stations shall employ automatic transmit power control such that stations operate on the minimum required power. 5.3.2	Low-power fixed subscriber stations (operating with an e.i.r.p. of 2 watts or less per 5 MHz), and in compliance with the emission mask applicable to base station, fixed station and high power fixed subscriber equipment as specified in Section 5.6.1 of RSS-195, are permitted to use outdoor antennas in all locations. 5.3.3	Low-power fixed subscriber stations (operating with an e.i.r.p. of 2 watts or less per 5 MHz), and in compliance with the emission mask applicable to mobile, portable and low-power fixed subscriber equipment as specified in Section 5.6.2 of RSS-195, are prohibited from using outdoor antennas or outdoor station installations. However, outdoor antennas may be used if professionally installed at locations that are at least 20 metres from roadways or in locations where it can be shown that the ground power level of −44 dBm per 5 MHz in the bands 2305-2315 MHz and 2350-2360 MHz or −55 dBm per 5 MHz in the bands 2315-2320 MHz and 2345-2350 MHz will not be exceeded at the nearest roadway. For the purposes of this SRSP, a roadway includes a highway, street, avenue, parkway, driveway, square, place, bridge, viaduct or trestle, any part of which is intended for use by the general public for the passage of vehicles. 5.3.4	High-power fixed subscriber stations (operating with an e.i.r.p. of more than 2 watts per 5 MHz), in compliance with the emission mask applicable to base stations, fixed stations and high-power fixed subscriber equipment as specified in RSS-195, are permitted to use outdoor antennas. 5.3.5	Vehicle-mounted antennas are prohibited for mobile and portable stations. 5.3.6	Transmitter unwanted emissions are specified in RSS-195. 6.1 In accordance with Appendix 3 of the Policy and Licensing Procedures for the Auction of Spectrum Licences in the 2300 MHz and 3500 MHz bands (http://www.ic.gc.ca/eic/site/smt-gst.nsf/eng/sf06013.html ), all fixed microwave point-to-point system incumbents are subject to the transition policy provisions. All fixed point-to-multipoint system incumbents are protected from displacement by WCS systems and not subject to these transition policy provisions. See Appendix 9 of the Policy and Licensing Procedures for the Auction of Spectrum Licences in the 2300 MHz and 3500 MHz bands for a list of existing fixed stations in the bands 2305-2320 MHz and 2345-2360 MHz to be protected from displacement by WCS. Aeronautical Mobile Telemetry (AMT) system are authorized on a secondary basis only where they do not constrain the implementation of WCS. Interested parties can find the frequency assignments licensed to incumbents in the radio frequency licensee database, available through Industry Canada’s Spectrum Direct website at http://www.ic.gc.ca/eic/site/sd-sd.nsf/eng/home . 7.1 The coordination requirements in this section apply to all WCS base and fixed stations (with the exception of fixed subscriber stations). A station that requires coordination shall not be placed in operation until an agreement has been reached. Licensees are encouraged to arrive at mutually acceptable sharing agreements that would allow for the provision of service of each licensee within its licensed service area to the maximum extent possible. the power flux density (pfd) produced by the licensee's station at ground level anywhere in the neighbouring service areas exceeds −110 dBW/m2/MHz. Pfd is calculated using accepted engineering practices, taking into account factors such as propagation loss, antenna directivity toward the service area boundary and curvature of the Earth. 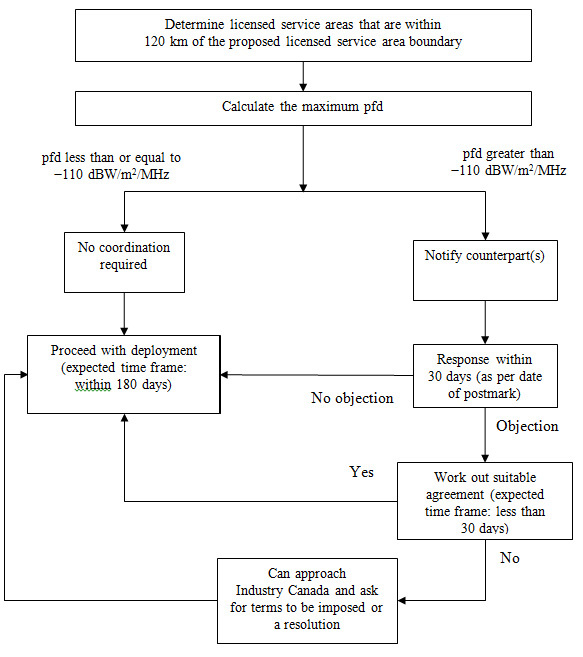 In this case, the deployment of WCS base or fixed stations (not fixed subscribers stations) is subject to successful coordination between affected licensees in accordance with the following process, described graphically in Annex A. 7.2.1 The licensee must notify the affected licensees of its intention to deploy the stations, and submit the information necessary to conduct an interference analysis. A list of suggested data elements is provided in Annex B. 7.2.2 The recipient of the coordination proposal must respond by registered mail (or another mutually acceptable method) within 30 calendar days of receipt (as per the date of postmark) to indicate any objection to deployment of the proposed facilities. If no objection is raised within that time frame, then the deployment of facilities may proceed. 7.2.3 If an objection is raised by the affected licensee, the licensees must work in collaboration to develop a suitable agreement between them before the deployment of stations. It is expected that the time frame to develop such an agreement should not exceed 30 calendar days. 7.2.4 Proposed facilities must be deployed within 180 calendar days of the conclusion of coordination, otherwise coordination must be reinitiated as per Section 7.2.1. 7.2.5 In the event that a mutually acceptable agreement cannot be concluded between licensees, the licensee seeking coordination may ask Industry Canada to facilitate resolution of the case. A station that requires coordination shall not be placed in operation until an agreement has been reached. 7.3 To facilitate the coordination of systems, licensees are expected to take full advantage of interference mitigation techniques, such as antenna discrimination, polarization, frequency offset, shielding, site selection, frequency selection and power control. 7.4 If a licence is transferred, assigned or reissued, any existing agreements that formed the basis of coordination shall continue to apply with respect to the new licensee unless a new agreement is reached. 7.5 A pfd level of −110 dBW/m2/MHz may be exceeded at or beyond a licensee's service area boundary on a provisional basis where there is no neighbouring licensee within 120 km of that service area boundary. However, in the event that a new licensee is authorized within 120 km of the service area boundary of an existing licensee, the latter will be required to meet the pfd at the new licensee's service area boundary unless otherwise agreed with the new licensee. 7.7 System expansion measures, such as the addition of cells, cell splitting and sectorization, must not force major changes in the system of other licensees, except by mutual agreement between the affected parties. Changes that would have potential impacts on other licensees, including cell site locations, cell sectorization and cell splitting, require consultation with the other licensees. 7.8 All results of analyses on pfd and agreements made between licensees must be retained by the licensees and made available to the Department upon request. 8.1 Coordination may be required with licensees in adjacent bands. Licensees should consult Industry Canada for the most up-to-date list of other licensees in the area in adjacent bands prior to deployment of stations. 8.2 Where an interference conflict resulting from the operation of WCS and radio systems in adjacent bands occurs, licensees are directed to resolve the conflicts through mutual arrangements between the affected parties following consultation and coordination. 8.3 When potential conflicts between systems cannot be resolved in a timely fashion, Industry Canada shall be so advised, whereupon, following consultations with the parties concerned, the Department will determine the necessary course of action. 8.4.1 Based on their service characteristics, AMT systems can be categorized into two classes: (i) Government of Canada (GoC) AMT and (ii) non-GoC AMT. 8.4.2 For GoC AMT sites that are location-specific and located in rural areas, coordination is feasible. Coordination is only required if a location-specific GoC AMT receiver is located within 15 km of a WCS base or fixed station (not fixed subscriber stations). GoC AMT systems that are transportable and used in suburban or urban set-ups are beyond the scope of coordination. A list of GoC AMT sites is available at http://www.forces.gc.ca/en/about-reports-pubs-report-plan-priorities/2013-other-canadian-armed-forces-bases-wings-selected-installations-sites-across-canada.page. To initiate coordination with GoC AMT systems, please contact spectrummanagement@forces.gc.ca directly. 8.4.3 Coordination between WCS and non-GoC AMT systems is needed if the AMT receiver is located within 5 km of a WCS base or fixed station (not a fixed subscriber station). Information on non-GoC AMT systems can be obtained under Radio Frequency Search on Industry Canada's Spectrum Direct website at http://www.ic.gc.ca/eic/site/sd-sd.nsf/eng/home . 8.5.1	WCS licensees operating in the bands 2305-2320 MHz and 2345-2360 MHz and SDARSFootnote 7 licensees operating in the bands 2320-2345 MHz are encouraged to arrive at mutually acceptable sharing agreements to facilitate efficient deployment of systems and coexistence between them. In such cases, WCS licensees must maintain a copy of any sharing agreement with an SDARS licensee, which shall be made available to the Department upon request. 8.5.2	The requirements below apply specifically to coordination with SDARS licensees in the absence of a sharing agreement. 8.5.4	WCS licensees must select base and fixed station sites and frequencies, to the extent practicable, to minimize the possibility of harmful interference to operations in the SDARS band 2320-2345 MHz. 8.5.5	WCS licensees that plan to operate a base or fixed station (not a fixed subscriber station) must, prior to commencing such operation, provide 10 business days’ notice to all SDARS licensees. WCS licensees that intend to modify an existing station must, prior to commencing such modified operation, provide five business days’ prior notice to all SDARS licensees. 8.5.6	For modifications other than changes in location, a licensee may provide notice within 24 hours after the modified operation if the modification does not result in a predicted increase of the pfd at ground level by more than 1 dB since the last advance notice was given. If a demonstration is made by the SDARS licensee that such modifications may cause harmful interference to SDARS receivers, WCS licensees will be required to provide notice five business days in advance of additional station modifications. 8.5.7	WCS base and fixed stations operating below 2 watts e.i.r.p. are exempt from the notice requirements set forth below. 8.5.9	A WCS licensee operating base or fixed stations (not fixed subscriber stations) must maintain an accurate and up-to-date inventory of its stations, which shall be made available to the Department upon request. 8.5.10	Notice periods are calculated from the date of receipt by the licensee being notified. If notification is by mail, the date of receipt is evidenced by the return receipt on certified mail. If notification is by fax, the date of receipt is evidenced by the notifying party’s fax transmission confirmation log. If notification is by email, the date of receipt is evidenced by a return email receipt. If the SDARS licensee and all potentially affected WCS licensees reach a mutual agreement to provide notification by some other means, that agreement must specify the method for determining the beginning of the notice period. 8.5.11	WCS licensees must cooperate in good faith in the selection and use of new station sites and new frequencies to reduce interference and make the most effective use of the authorized facilities. WCS licensees should provide SDARS licensees with as much lead time as practicable to provide the latter with ample time to conduct analyses and an opportunity for prudent base station site selection prior to WCS licensees entering into real estate and tower leasing or purchasing agreements. WCS licensees must have sufficient operational flexibility in their network design to implement one or more technical solutions to remedy harmful interference. Licensees of stations suffering or causing harmful interference, as defined below, must cooperate in good faith and resolve such problems by mutually satisfactory arrangements. 8.5.12	If the licensees are unable to resolve such problems, Industry Canada will consider the actions taken by the parties to mitigate the risk of interference and remedy any alleged interference. In determining the appropriate action, the Department will take into account the nature and extent of the interference and act promptly to remedy the interference. Industry Canada may impose restrictions on the WCS licensees, including specifying the transmitter power, antenna height, or other technical or operational measures to remedy the interference, and will take into account previous measures by the licensees to mitigate the risk of interference. a WCS ground signal level greater than −44 dBm per 5 MHz in the bands 2305-2315 MHz or 2350-2360 MHz, or −55 dBm per 5 MHz in the bands 2315-2320 MHz or 2345-2350 MHz, on a test drive route, which is mutually agreed upon by the WCS licensee and the SDARS licensees, for more than 1% of the cumulative surface road distance on that drive route, where a test demonstrates that SDARS would be muted over a cumulative road distance of greater than 0.5% (incremental to any muting present prior to use of WCS frequencies in the area of that drive test). 9.1 Canadian licensees in the frequency bands 2305-2320 MHz and 2345-2360 MHz that operate stations near the Canada-United States border are subject to requirements to coordinate with U.S. licensees on the other side of the border in accordance with the Interim Arrangement Concerning the Use of the Frequency Bands 2305-2320 MHz and 2345-2360 MHz by Stations in the Wireless Communications Service (WCS) Near the Canada/United States of America Border . The current requirements are stated below. These requirements are subject to change from time to time in accordance with international agreements and arrangements. 9.2 Coordination shall be carried out by the WCS licensees for their respective service areas on both sides of the border. 9.4 Licensees must retain all data and calculations related to coordination of stations and/or with Agreements and must provide Industry Canada with such data and calculations, along with other supporting documentation upon request. 9.5 Industry Canada requires any licensee that receives a licence by way of transfer or subordinate licence to comply with the terms of any Agreement relating to a station unless a new Agreement is reached. 9.6 When licensees are unable to conclude mutually acceptable sharing arrangements, the following sections apply. 9.7 The stations that are to be considered for coordination under sections 9.7 to 9.9.6 of this document are base stations and their associated subscriber stations, and shall be referred to jointly as WCS systems. 9.9.1	The licensee seeking coordination shall determine the maximum pfd value at and beyond the border that could be produced by any single transmitting station of the WCS system. In making this determination through calculation, the licensee shall use sound engineering practices and generally accepted terrain-sensitive propagation models. The licensee shall disclose, upon request by the Administration, all data and calculations used in determining compliance with this document. 9.9.2	The coordination request shall be sent by registered mail (or mutually acceptable method) and shall provide notification that the recipient may respond by registered mail (or mutually acceptable method) within 30 days of its receipt to state any objection to deployment of the proposed facilities. It should be noted that the date of postmark shall be taken as the date of response. If no objection is raised by the U.S. licensee within this time period, the coordination process may be considered to be complete. 9.9.3	If an objection is raised by the recipient of the coordination request, licensees must work in collaboration to develop a mutually acceptable solution to the potential interference problem. It is expected that the time from the date of the objection to develop and reach agreement on such a solution should not exceed 30 days. 9.9.4	In the event that a mutually acceptable agreement cannot be concluded between licensees, the licensee seeking coordination may ask its Administration to facilitate resolution of the case with the other Administration. A station that requires coordination shall not be placed in operation until an agreement has been reached or until both Administrations concur and authorization by the appropriate Administration has been provided. 9.9.5	In cases where there is no licensee within 120 km on the opposite side of the border, no coordination is required. However, no station may produce a pfd at or beyond the border that exceeds −110 dBW/m2/MHz, unless agreed to by both Industry Canada and the U.S. Federal Communications Commission (FCC). The flow chart depicts the process to be followed in order to determine the coordination process between WCS licensees in the absence of a sharing agreement. The blocks and choices are a representation of the process listed in Section 7.2 of the SRSP. Determine licensed service areas that are within 120 km of the proposed licensed service area boundary. Proceed with deployment (expected time frame: within 180 days). If the response is no objection within 30 days (as per date of postmark), proceed with deployment (expected time frame: within 180 days). If the parties cannot work out a suitable agreement (expected time frame: less than 30 days), the parties can approach Industry Canada and ask for terms to be imposed or a resolution. These parameters are for the coordination of the base and fixed stations (not fixed subscriber stations). Interference mitigation may involve various techniques, including those cited in Section 7.3 of the main document. As defined in the Radiocommunication Act , "harmful interference" means an adverse effect of electromagnetic energy from any emission, radiation or induction that (a) endangers the use or functioning of a safety-related radiocommunication system, or (b) significantly degrades or obstructs, or repeatedly interrupts, the use or functioning of radio apparatus or radio-sensitive equipment. For nomadic devices in the fixed service, see also RSS-102. See RSS-195 for definitions of base, fixed, fixed subscriber, mobile and portable equipment. A transmission duty cycle is the ratio, expressed as a percentage, of time in which a WCS station transmits uplink information to the total time measured from the beginning of one transmission to the beginning of the next. The SDARS systems operate in the band 2320-2345 MHz, in accordance with the broadcasting rules and procedures outlined in BPR-9, Part 9: Application Procedures and Rules for Terrestrial S-DARS Undertakings (Satellite Digital Audio Radio Service) . Section 3.5 of BPR-9 describes a coordination process for terrestrial SDARS repeaters exceeding 50 watts e.i.r.p. and WCS systems, which must be followed to ensure coexistence of these systems. Note: BPR-9 is currently under review. Stations located at high elevations and at distances greater than 120 km and less than 160 km from the border are subject to international coordination if they have a radio line-of-sight path to any point on the surface of the Earth at or beyond the border and if they produce a power flux density (pfd) at ground level anywhere in the other country's territory that exceeds −110 dBW/m2/MHz.